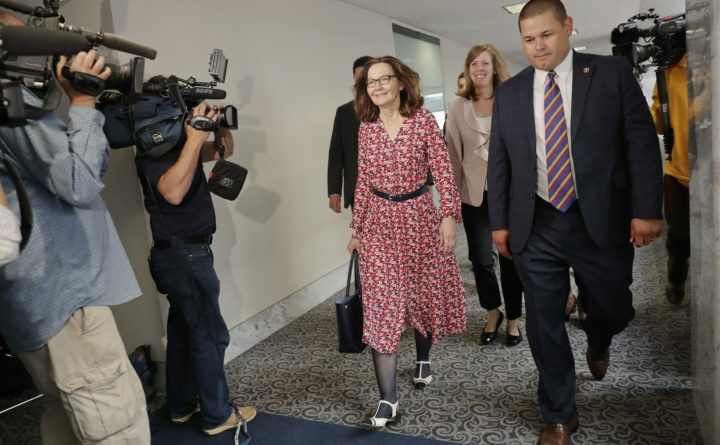 CIA Director Nominee Gina Haspel walks past television cameras as she heads to her next meeting, on Capitol Hill in Washington, Monday, May 7, 2018. Haspel was meeting with senators today whose support could be key to her confirmation. WASHINGTON — President Donald Trump’s choice to lead the CIA faces her first public test Wednesday as she goes before the Senate Intelligence Committee for a confirmation hearing — and the fate of her nomination will be up to a handful of senators from both parties with some tough questions about her past. Gina Haspel’s task is to find the 50 votes she needs to become the first woman and first career operations officer to lead the agency in decades. While Republicans control 51 Senate seats, an ailing Sen. John McCain, R-Arizona, is not expected to be present for the Senate vote, probably next week. With Sen. Rand Paul, R-Kentucky, staunchly opposed to Haspel, that means if all other Republicans back her — and that’s not yet clear — she would still be short a vote. The White House and the CIA have launched a vigorous public relations campaign on Haspel’s behalf, touting her experience at the agency. But many Democrats and Republicans say they have questions about the extent of Haspel’s involvement in the U.S.’s now-discredited torture program in the wake of the Sept. 11 terrorist attacks. In 2002, Haspel was sent to northern Thailand as CIA chief of a secret detention facility, known as Cat’s Eye, where terror suspects had been imprisoned and subject to then-approved use of torture techniques. — Sen. Dianne Feinstein, D-California. The driving force behind the Senate’s 7,000-page report detailing the CIA’s torture of terrorist suspects, Feinstein is keeping her thoughts on Haspel’s confirmation to herself. Feinstein, who is facing a Democratic primary challenge next month from the left, met privately this week with Haspel. Haspel, who has spent the majority of her CIA career undercover, is facing public scrutiny for the first time. But she and Feinstein, a veteran intelligence committee member, are well-acquainted. Feinstein’s two decades on the committee has brought her in contact with Haspel and dozens of other senior members of the intelligence community, and former aides say she has a deep respect for the CIA and its people. Those relationships will make her vote on the Haspel nomination all the more difficult. — Sen. Lindsey Graham, R-South Carolina. The White House has used Graham’s support for Haspel in its campaign to help her win confirmation. A White House press release earlier this month quoted Graham as calling Haspel “very highly qualified” and noting that she has the support of a number of former intelligence chiefs. But Graham’s close friend, McCain, whom he joined during the Iraq War to push for a ban on torture, was a prisoner of war who was tortured by the Viet Cong and has questioned Haspel’s involvement with the U.S.’s program. McCain is undergoing treatment for brain cancer and has not been in Washington recently. Graham says he’d be satisfied if Haspel tells senators at her confirmation hearings that she understands various forms of torture are no longer an authorized interrogation technique. “I think for her to acknowledge that misbehavior is no longer allowed. … she will have to adhere to the law as I believe it exists today, and that will be the test for me,” Graham told CNN. — Sen. Susan Collins, R-Maine. She has been an independent swing vote for the GOP at times, and supported the 2015 McCain-Feinstein amendment to prevent the use of torture. She hasn’t yet said how she will vote. Collins told reporters she had spent “considerable time” reviewing some of classified material the CIA had released and had a “good” meeting with Haspel. — Sen. Rand Paul, R-Kentucky. The only Republican known to be opposed to Haspel, Paul is under pressure from the White House to reverse himself. But Paul already flipped on his pledge to oppose Mike Pompeo, Trump’s choice for secretary of state and may be reluctant to experience the political effect of doing so twice. But Paul, who is not a member of the intelligence committee, told McClatchy on Tuesday that he had no plans to meet with Haspel. “I’m a no on her, and I can’t be persuaded,” he said. Before the Pompeo vote, Trump said he was certain that Paul wouldn’t “let me down.” But Trump has so far remained publicly mum on Paul’s stance on Haspel. A dark money group is airing an ad in Kentucky, accusing Paul of siding with terrorists by threatening to vote against Haspel, a Kentucky native. — Sen. Joe Manchin, D-West Virginia. A member of the Senate Intelligence Committee, Manchin met with Haspel this week and has said he has an “open” mind about the vote. He’s one of 10 Democrats up for re-election in states that Trump won in 2016 and had been among the handful of red state Democrats that Republicans had wooed to support Pompeo. He and six other Democrats last month voted to confirm Pompeo. McClatchy writer Emily Cadei contributed to this report.